I've been the weird girl in the bathroom taking photos with her phone for nearly 2 years...and Volume 1 in print is finally HERE! 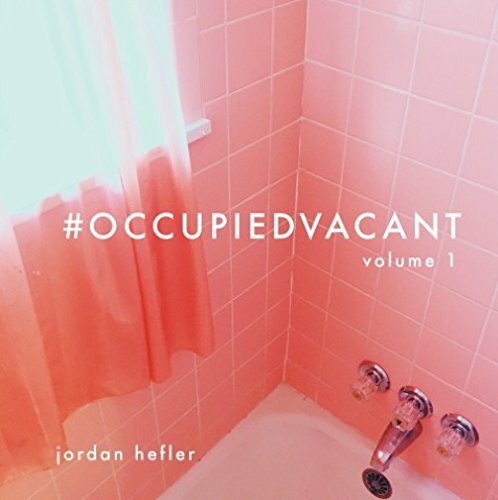 #OccupiedVacant quickly grew into a social media series documented by mobile phone across America, threaded together by the hashtag #OccupiedVacant on every post. This photo series observes the beautiful and the strange, the functional and the decorative, the immaculate and the questionable. It is a series of private spaces exploited in public places. Each image has been photographed and edited on a mobile phone, originally intended for social media only. Due to popular demand, Volume 1 became a print compilation of selected images from January 2015 to November 2016. NOTE- I am making less than $5 on every book sold. No joke. This book is not really about me at all. I have put a ton of work into it, but I get very little monetary gain from it. I apologize that the print and production costs are so high. They are much higher than I would like, but it is out of my control for now. This series started as fun social media project, and thanks to your feedback and support it is now in print form! Please help make Volume 1 successful so that I can explore more economical options for future volumes to come! #OccupiedVacant began as a color study. I visited Memphis, Tennessee in January of 2015 and was constantly entertained by how colorful and sketchy all of the bathrooms on Beale Street were. There would be bright colors and graffiti and neon soap residue and stickers of bands and just general grossness in every corner... but it was kind of really aesthetically pleasing in a way. I posted a few of them on Instagram because I liked the color relationships I saw and I think even my boyfriend was like yo you need to cool it with all the bathroom posting, this is weird. I kept noticing bathrooms after that, and it's something that just kind of stuck with me. So I was like what the heck, people have photo series about all sorts of stuff. Why can't mine be about bathrooms? At first, I was mostly interested in color relationships. 90% of the time when I'm drawn to photographing a subject, it's because of the coloring. There became a reoccurring pattern of times that I would enter a bathroom and look in the mirror and see that my outfit matched my surroundings. It was freaky. Then it got me thinking about mirror pics and how those were such a cheesy thing to do in the "Myspace days." Eventually it got me noticing bathrooms in general, and how weird they were. I got to thinking about the nature of privacy, and how taking a mirror selfie in a bathroom and posting it on social media completely defeated the purpose of the bathroom being a private place....but also summed up the mentality of our generation perfectly. Always being a fan of abstract art and color in general, I realized that this series could simply be a documentary study of that: The photos didn't necessarily have to have me in them to be exploiting a private place on a public platform. So I just started snapping photos with my phone of aspects that I thought were interesting while in public restrooms. But then as I got deeper and deeper into the project I started noticing really ridiculous juxtapositions. For instance, a bathroom that looked like it hadn't been cleaned since the stone age would have a potted plant in the corner, or a really sketchy restaurant would have a restroom that looked like more effort had been put into it than the establishment itself. It started making me question....why? Like what is the point of that potted plant in the corner if you're not even going to put a door on the stall? Or who is ever going to see this beautiful mural on the wall of your bathroom hallway if they're afraid to enter your gas station in the first place? It almost became a fun game to see what strange things I'd see when I would visit the bathrooms. It became a commentary on aesthetics and the nature of public and private. All of this stemmed from just having to go pee and having a cell phone! Now I make a point to use the restroom everywhere I go...and of course I bring my phone with me. You can see a lot of images on Instagram if you search the hashtag #OccupiedVacant, but this is only a small small fraction of what ended up going in the book. I appreciate everyone who has been supportive and encouraging of this very strange project from the get-go. If you purchase the book, I do hope you enjoy it! And feel free to contribute your photos to the hashtag online! I would LOVE for this to be a collaborative effort!